Stunning, Air-Conditioned, light-filled,open-plan living room with huge flat screen TV in full HD with all Sky channels.DVD player, 4 speaker music system with IPOD doc and CD drive. Free WiFi. Fully equipped kitchen plus electrical appliances & dining area. Cloakroom/WC. Lounge opens onto large covered terrace furnished for al fresco meals. Hot Stone & Raclette machine provided. Laundry room, with washing/dryer machiine & extra fridge. Third Bedroom with single bed, wardrobe, bedside table and optional 2nd single bed. Mosquito nets in all bedrooms. Pretty, sunny, secluded garden with comfortable loungers overlooks 6-hole practise golf course, pine and olive trees and surrounding wooded hillsides. The house is within the exclusive Gassin Golf & Country Club permitting guests access to play the 18-hole Gary Player Championship Course, one of France's finest. The Club House, restaurant, terrace and bar complement additional golfers' facilities of practice short course, driving range, short game area and excellent on-site pro shop for adult and children's lessons. 100 metres from the house is our stunning outdoor Olympic size swimming pool with sunbathing surround, loungers, parasols and changing chalet with showers and WCs. Adjacent to the pool is the fully equipped fitness centre and 2 excellent tennis courts. 10 minutes by car to St Tropez with its designer shops, antiques & food market, Old Port cafés, superb restaurants and famous night clubs. Just over 10 minutes to long sandy beaches, al fresco restaurants, and the sun-soaked beauties of the Mediterranean seaside. Hire a bicycle and explore the hillside and coastal tracks leading to vineyards or villages; find a boat and discover secluded beaches, romantic islands and lovely coastlines; take your car and reach the mimosa decked Provencal towns and villages of Var, the astounding Gorges de Verdun or the historic towns and villages of mediaeval France. As an Oxford University Graduate in modern languages, it is a dream come true to own a home near Ste Tropez in the South of France. To spend more time with my husband and 2 gorgeous sons, My other main hobby is threatre and I also like to act in and to direct plays. I earn my living as a private tutor of French, Spanish, Latin and Italian. I adore animals and our dog is we own a cheeky little Cairn Terrier. I recently took up golf and now love it. Being able to play the exclusive Ste Tropez golf course from our house here in Gassin is a fantastic treat. From our garden we can step out onto the compact golf course, walk a few yards to the sumptuous pool, tennis courts and fitness area. Above all we are blessed with lots of light and sunshine from morning to sundown. Not all the properties here are so lucky. Our garden is exceptionally well placed for privacy, sheltered dining and sun bathing and has gorgeous views over the course and the mountain top village of Gassin. Bathand guest towels are provided for all bedrooms. The Main Bedroon Ensuite Bathroom enjoys a deep bath,a wall mounted power shower with fixed splash proof shower screen. A large washbasin tops a generous storage cupboard and above the WC is additional fitted cupboard space. Add a radiator, lit magnified vanity mirror and fitted hair dryer. Second Bathroom has a splash proof cubilce and separate washbasin, cupboard storage and heater and window. Upstairs separate WC with window. Downstairs WC with large washbasin, window and storage cupboard and basket of swimming pool and beach towels. All bath and shower fittings are of high quality. Free WiFi. Full HD large flat screen TV with SKY TV channels.Music system with docking station for IPOD/MP3 players. DVDs, books, board games for guests' use. Mosquito nets in all bedrooms. South east facing sun trap. Airconditioning. The location is perfect with views over the golf course, south facing tranquil garden and stunning views over the bay of St Tropez where its famous beaches are only minutes away. We had a wonderful time exploring the local area with its picturesque, mediaeval villages, its vineyards and excellent restaurants plus a few rounds of golf on the exclusive, Gary Player, championship course. The house is beautifully equipped and we loved the huge, private sun terrace leading off the upstairs bedrooms. The pool complex is stunning and convenient, as are the tennis courts and the fitness centre. We would definitely recommend this villa as a perfect holiday choice for anyone who appreciates really gorgeous surroundings and fabulous facilities. Wonderful place for a Holiday. Excellent Property overlooking Golf Course. Property clean & well equipped. Swimming Pool very close by. Near to St Tropez & other places of interest to visit with lovely restaurants. We really enjoyed our stay. The house had everything we needed and the flower filled garden was just perfect for relaxing with a glass of local wine. The on site facilities included a golf course, practice area as well as a club house, huge swimming pool and fitness centre. The location was perfect - peaceful but near St Tropez, the beaches and local mediaeval hill top villages. Wow! Can there be a more idyllic spot anywhere in France? A stone's throw from the yacht flanked beaches of Saint Tropez, this is a truly blissful, secure and peaceful setting. I spent seven wonderful days here last summer and would recommend it to anyone of any age. Aside from the beautifully equipped accommodation, a short walk away there are tennis courts, a fitness centre, large pool area and, at the heart of what is a small community, there's a truly brilliant championship golf course. We made good use of all these amenities. And if golf's your thing you must take your Smartphone and take some pics from the 13th fairway which looks down across the bay of Saint Tropez. It's an utterly breathtaking view. In the evenings we either went out to the nearby hilltop villages of Gassin, Grimaud and Ramatouelle or stayed in and ate on the terrace and enjoyed complete tranquillity. Aside from the beautifully equipped accommodation, a short walk away there are tennis courts, a fitness centre, large pool area and, at the heart of what is a small community, there's a truly brilliant championship golf course. We made good use of all these amenities. And if golf's your thing you must take your smartphone and take some pictures from the 13th fairway which looks down across the bay of Saint Tropez. It's an utterly breathtaking view. We spent a lovely week at this house at Gassin Golf and Country Club. The house is clean and well maintained. It is peaceful. There is a great golf course and handy practice course. The pool is just a short walk from the house. It is in a wonderful location, a short drive to St Tropez, Gassin, Ramatuelle, and the sandy beaches of Pampelonne. I would highly recommend it. 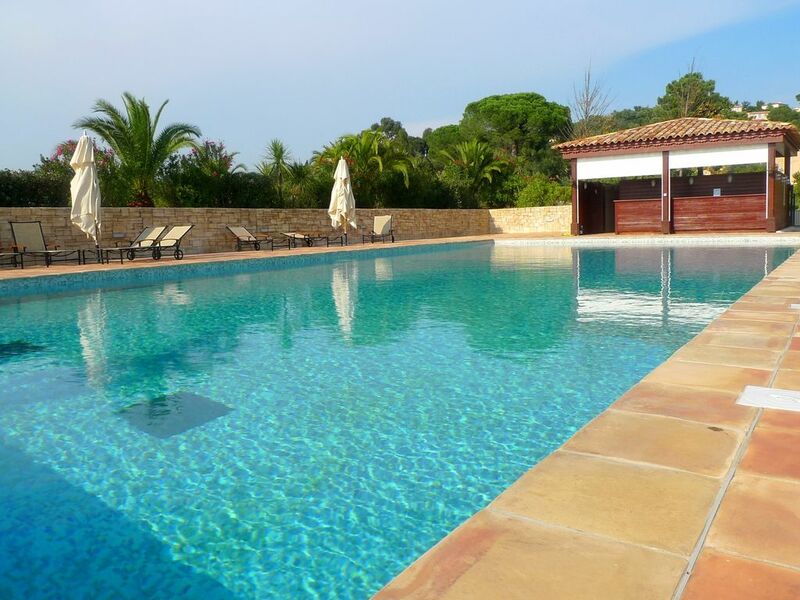 St Tropez - stylish 3-bed house with private garden. Sleeps 6. Free WiFi, HD TV with Sky TV & DVD & MP3 Music. Inside gated domain of Gassin Golf with 24/7 security. Exclusive rights to private Gary Player Championship Course plus practise areas/facilities. Stunning Clubhouse restaurant, pool complex, tennis courts and fitness centre. Surrounded by vineyards,wooded hillsides and historic Gassin. 10 min to St Tropez for it famous markets, shopping, varied restaurants, catés, luxury yachts and night life, including Club VIP. 12 minutes to sandy beaches, swimming in the Mediterranean and seaside restaurants, such as Club 55 or super-chic Nikki Beach. Enjoy nearby medieval hilltop towns of Gassin, Grimaud & Ramatuelle & their Summer music festivals. Sample local wines & champagne at adjacent Minuty or Berlieu. Visit local markets, villages and vineyards. Discover rural and coastal secrets by boat, bike or car . Or just relax in our tranquil garden, enjoy the sun, & sip chilled rosé. Golf: Our on-site 18 hole Gassin Golf course is a Gary Player Championship course and exclusive to those staying within our Country Club. Golf buggies are provided within the green fee. Competitions are open to those with handicap/medical certificates. Golf lessons are available from the excellent on-site pro, Robert Rousille .The Club House has a fully stocked pro-shop, restaurant, bar and terrace. From the end of our garden you step onto a 6-hole short game pratcise course. We also have a superb driving range and separate short game practice area and putting green. 10 min away is the higher up to the Saint Maxime Golf Course. Within an hour there are several other golf courses you can try, most notably Endemol with its stunning and challenging water features. Deposit of 25% scures reservation at time of booking. The flat rate cleaning fee is paid weekly.